METAIRIE, LA. 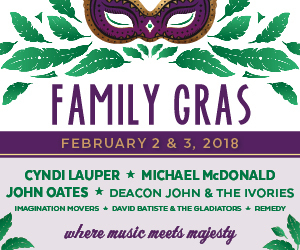 – Grammy award winners Cyndi Lauper, Michael McDonald and Rock and Roll Hall of Fame inductee John Oates will perform at this year’s annual Family Gras concert celebration presented by the Jefferson Convention & Visitors Bureau. The curtain will rise on the 11th edition of Family Gras on Friday, February 2nd at 5:30 p.m.and continues Saturday, February 3rd. Because February 4 is Super Bowl Sunday, Family Gras organizers have limited this year’s concert festival to two days rather than the usually-scheduled three-days of music. There are no parades planned for Super Bowl Sunday in Jefferson Parish. Friday is Louisiana night. David Batiste & The Gladiators will kick off Family Gras at 5:30 on Friday, February 2. The group, formed by David Batiste and his brothers in 1962, is a funk and soul band with an international following. The band was launched as talent show winners at Harlem's famous Apollo Theater. David was also the keyboard sensation for the Meters and performed on Saturday Night Live in 1977. They will be followed by Deacon John and the Ivories. New Orleans legend and favorite Deacon John Moore is an inductee into the Louisiana Blues Hall of Fame. Saturday begins with The Imagination Movers, a four-member band that has packed venues around the world. The Movers are rated the Number 1 major tour act for families by Ticketmaster and won a Daytime Emmy Award for their TV show on Disney Junior Channel. They will be followed by Remedy, a group of local teenagers who intermingle original compositions with classic, contemporary and alternative rock covers. The national headliners begin with John Oates, a Rock and Roll Hall of Fame inductee, and one half of the duo Hall & Oates. Oates is a singer/songwriter who co-wrote many of the Top 10 songs (with Hall) including: "Sara Smile”, "She's Gone", "Out of Touch”. Oates also co-wrote “You Make My Dreams", "I Can't Go for That (No Can Do)", "Maneater", and "Adult Education". Oates will play Hall & Oates favorites as well as songs from his most recent solo album, Arkansas. Following Oates will be five-time Grammy winning artist Michael McDonald. McDonald is an American singer, songwriter, keyboardist and record producer whose career spans more than 45 years. After perfecting his craft as a studio musician, he became an integral member of Steely Dan before joining the Doobie Brothers. McDonald sang the lead vocals on some of the band's best-known songs such as "Takin' It to the Streets", "Minute by Minute", and "What a Fool Believes" which became a No. 1 single in the U.S. and earned him a 1980 Grammy Award for Song of the Year along with co-writer Kenny Loggins. Closing out Family Gras 2018 on Saturday will be pop culture icon Cyndi Lauper. Her debut solo album She's So Unusual(1983) was the first debut female album to chart four top-five hits on the Billboard Hot 100—"Girls Just Want to Have Fun", "Time After Time", "She Bop", and "All Through the Night". She has won awards at the Grammys, Emmys, Tonys, the New York's Outer Critics Circle, MTV Video Music Awards (VMAs), Billboard Awards, and American Music Awards (AMAs) and is an inductee into both the Songwriters Hall of Fame and the Hollywood Walk of Fame.